Dogs with long nails can be destructive. They can scratch you while playing and mark up floors and furniture, and they may feel discomfort while running. Trimming your dog's nails can be difficult at first. Most dogs, however, do not like having their paws handled. The best way to trim your dog's nails is to start from an early age. This way, they learn to not be nervous during trimming, and so they are less likely to panic and bite you. If you are just starting out, you can have a trained vet show you how to trim your dog’s nails carefully. Place the dog on a table or get down on the floor so you are close to its paws. Lean on the dog gently while standing on the side of the table, facing the same way the dog is facing. Place your arms over the dog. Keep one arm over the neck and the other over the back while trimming the front nails. Hold the dog’s paw in one hand and the trimmer in the other hand. Hold the trimmer so it is at a right angle to the nail. Cut the nail approximately within 2 mm of the quick, or reddish part of the nail. For dogs with dark nails, leave the nails a bit longer so you do not cut the quick. 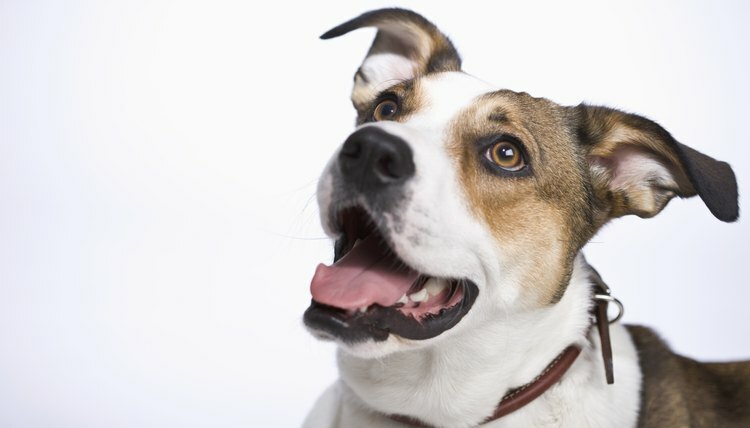 Place your arm over the dog’s head if it tries to squirm or stand up. Repeat Steps 5 and 6 for each nail on the front paws. Drape your arms over the dog's shoulder and back and grab the back paws. Repeat Steps 5 and 6 for the back paws. Start trimming your dog's nails at an early age so it gets used to it. If needed, use a muzzle to prevent biting if the dog is very nervous or squirmy. Give your dog small treats during and after cutting its nails. Do not act nervous when you trim your dog’s nails. The dog will pick up on your fears, so try to act calm. The quick is the red part of the nail. Cutting it will cause the nails to bleed and will hurt the dog. Avoid cutting it. It is harder to see the quick on black nails. Trim black nails carefully, cutting only a couple of millimeters with each cut to prevent hitting the quick.